We had heavy rains most of the week of 6/5/17, then rough seas for a couple of days. I was in port most of that week, but got to fish in the backwaters of south Estero Bay on Friday, 6/9, with Ashton Lockhart and his nine-year-old daughter, Barrett. Barrett is proud to say she caught more fish than her dad did, but they collectively caught two limits of keeper mangrove snapper to 12 inches, along with a 14 inch black drum and a 16-inch black drum (Barrett is also proud to say she caught the bigger one!) They released a 3-pound sail-cat probably due to all the rain and fresh water influx), along with one short sheepshead and six smaller snapper. They lost a couple of fish that snapped the line--maybe reds. Everything bit on live shrimp. After more rain over the weekend, I headed offshore Monday, 6/12. With Mark Paradise and his son, Luke. We fished 19 miles west of New Pass with squid and cut bait, and the guys boxed a dozen nice-sized grunts, a 15-inch whitebone porgy, and a couple of keeper lane snapper, which were all destined for a fish tacos dinner. They released a few mangrove snapper shorts and red grouper shorts. Jose and Demi Diaz and family fished 17 miles west of New Pass with me on Tuesday, 6/13/17, and used cut-bait and squid to box twenty keeper lane snappers to 12 inches, along with a mess of grunts. They caught and released about twenty-five red grouper, all shorts and had to be released, all the way up to 19 7/8 inches, just short of the 20-inch legal size. Dobbs Ackerman and his son, Angus, fished their first of two consecutive mornings with me on Friday, 6/16, 20 miles west of New Pass, using squid for bait. They released fifteen red grouper to 19 7/8 inches, and boxed seven keeper lane snapper and grunts to 13 inches. Dobbs and Angus had planned to fish the backwaters the following day, but they enjoyed the offshore experience so much on Friday that they decided to head offshore again on Saturday, 6/17. Seas were calm, and we got out 22 miles from New Pass, baited with squid and cut-bait. Angus reeled in a nearly 23-inch red grouper keeper, and the guys released twenty red grouper shorts. They added a dozen keeper lane snapper to 17 inches to the fish box, and kept one 14-inch grunt out of the fifteen grunts they caught in all. They battled a 4 ½-foot blacknose shark for a while, until it pulled off and got away. 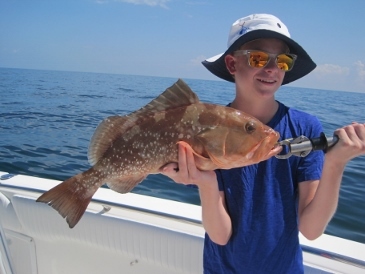 The photo shown is of young angler, Angus Ackermann, with a 23-inch red grouper, caught on squid on a recent offshore trip. Thursday, 6/29, I fished 22 miles west of New Pass with Brian Vandeventar, T.J. Duran, and Alan Smith, The guys did well with snapper and grouper, using squid and cut-bait. They landed two keeper red grouper, 23 inches and 25 inches, and released thirty-some red grouper shorts. They added to the fish box twenty keeper lane snapper to 16 inches. After a lot of rain and stormy conditions, I finally got back on the water on Saturday, 6/24, and headed 23 miles offshore with Chris O’Hern and his friend, Charlie. Seas were still a little choppy heading out, but they calmed down nicely over the course of the morning and early afternoon. The guys boxed fifteen keeper lane snapper to 15 inches, which bit on squid. Red grouper shorts to 19 inches bit on squid and cut-bait, and were released. Wednesday, 6/28. I fished 22 miles west of New Pass with the McLrazy clan—Charlie, Alpen, Lindsay, Katie, Annie, and Katherine. The group used cut-bait and squid to catch two dozen keeper lane snapper to 15 inches, along with a keeper 21-inch red grouper. They released red grouper shorts. Winds and seas were higher on Friday than they were the previous day. I headed offshore 17 miles from New Pass with Patrick Williams and his teenaged sons, Ryan and Carter, who were interested in catching, but not keeping, fish. The tide was moving pretty fast, making it difficult for the boys to keep their bait on the bottom, but they rose to the challenge and caught and released two dozen would-be-keeper lane snapper. They also released six red grouper shorts. Everything bit on cut-bait. SW FL-Bonita Beach: Offshore or Inshore--Great Fishing!